Very often I have an idea for a recipe and it takes me a few times to get it right. In fact, usually it takes me more than a few times! But once in a blue moon, I try something on the fly and I love it on the spot, like culinary love at first bite. That’s what happened with this salad. Last year I was putting together a Mexican-inspired menu for my April classes and I was trying to think of a fresh and easy salad to teach. I wanted something clean and healthful with all the ingredients I love to use when I make Mexican food, but without it tasting like a taco salad. 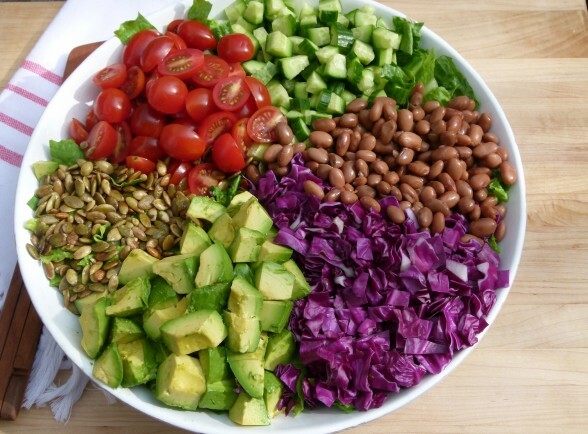 I happen to adore chopped salads, so off I went with crisp romaine lettuce, red cabbage, cherry tomatoes, cucumbers, pinto beans, avocado and my favorite part, toasted pepitas (pumpkin seeds.) I made a very light dressing with apple cider vinegar, orange juice and enough cumin to give it that south-of-the-border flavor. On that day of recipe testing at home last year, I nearly ate the entire salad. Whereas this salad may not win any awards for sophistication, what in the world is not to love? Not only does this salad look gorgeous, it is addictive and crunchy and juicy and creamy. You know how I love a crunchy-creamy combo. Since then, I have made this salad virtually every time we were invited to a pot luck or backyard barbeque. 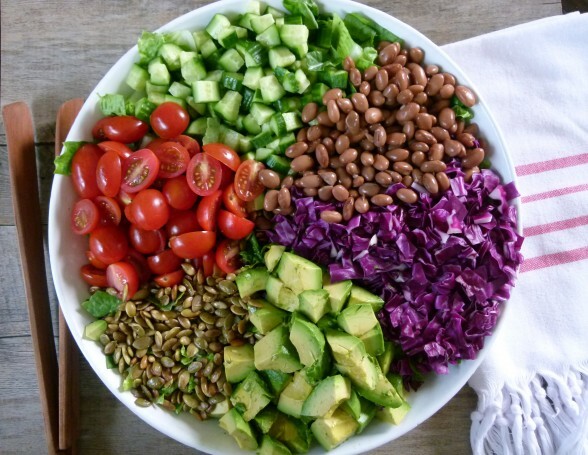 The beauty of this salad, besides being a giant bowl of antioxidants, vitamins and fiber, is that it can prepped almost entirely in advance. 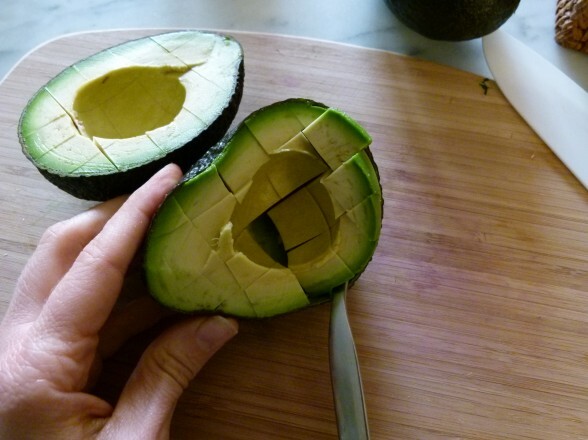 Chopped veggies go into a serving bowl with dressing in a jar and avocados to be cut just before serving. If you’re vegan, vegetarian or if you’re like me and you’re going to a party where you fear there might be non-organic meat, I think this can easily be a main course salad on it’s own. The pinto beans and pumpkin seeds offer more than enough protein. Although my husband is a bit of a carnivore and loves this salad with grilled chicken chopped in. Shrimp works great, too. Fast forward a year later when I taught this salad again a few days ago. My assistant and I each grabbed a bit in a cup to go and crunched our way home, wishing we had had bigger cups. I know you’ll love this salad just as much as I do. Make the dressing: whisk first five ingredients in a small bowl. Add olive oil and whisk completely until emulsified. Season with additional salt and pepper to taste. 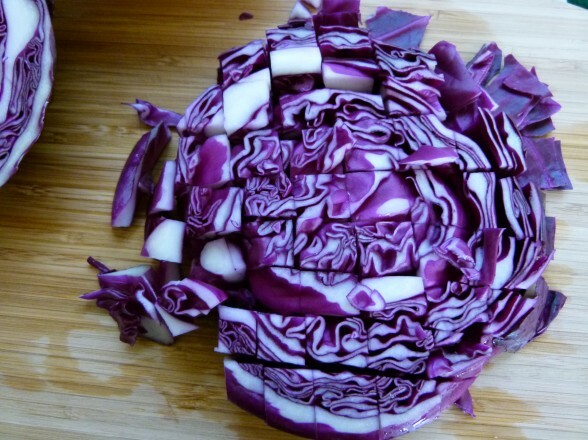 Combine lettuce and cabbage in a large bowl. Add pinto beans, cucumber and cherry tomatoes. Toss with enough dressing to coat lightly. Drizzle a little dressing on avocados and gently mix into the salad. 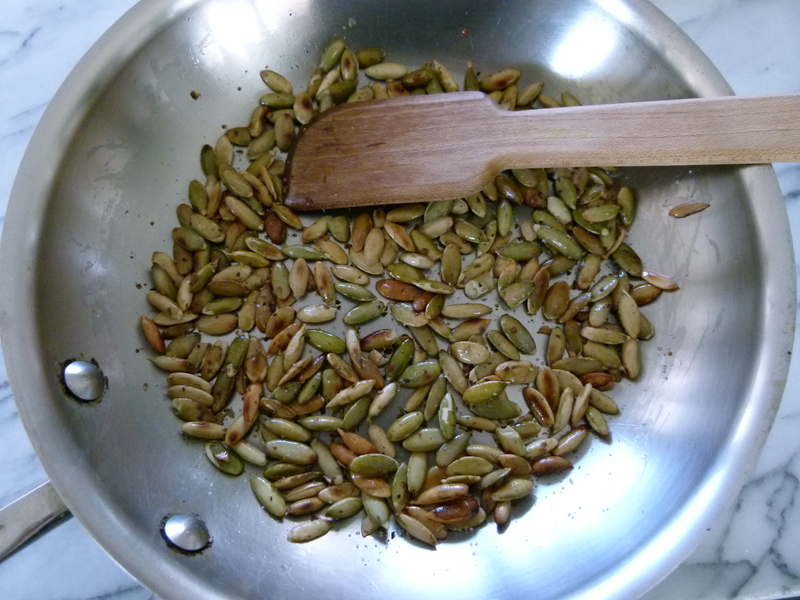 Sprinkle pepitas on top. If you have additional dressing, save in the refrigerator for another time. There's enough dressing that you can probably add a bit more cabbage or other veggies. 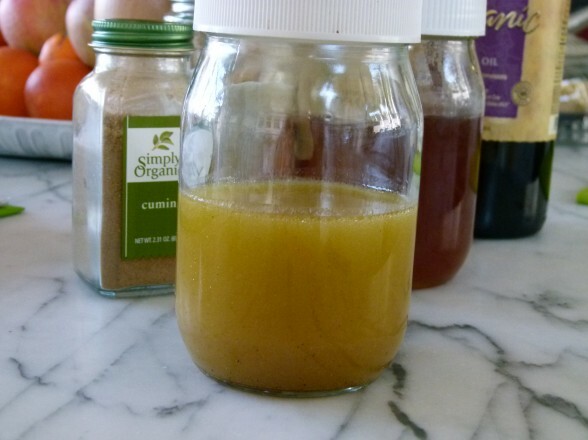 If you cut back on the oil by about 2-3 Tablespoons, the dressing makes a great marinade for grilled chicken or shrimp. Both would be nice on top of the salad, although there is adequate protein from the beans and pepitas. This salad is light and delicious and very easy to prepare. I love that it doesn’t have any cheese. I have served this twice at parties and it’s a hit because it’s so unique and delicious. Thanks, Sally! It’s my go-to salad for potlucks and Mexican-inspired meals. How would you guess it would be to sub out the orange juice for lemon or lime juice? The orange juice gives the dressing a light sweetness and allows you to use less oil. If you add additional lemon or lime juice, it’s more acid and it could become too tart at least for me. But it’s hard to know if you would like it! I needed a recipe with a twist… read this one and it seemed easy to make and it was! The outcome was amazing, this salad looked great, tasted amazing and it was a hit at dinner. Another recipe to keep handy! trying the grilled vegetable salad today! Thanks for sharing all the tips and easy to follow directions! Haven’t had time to try this salad yet, if I want to add chicken to it how long should I marinade it for? Sounds delicious! Chicken cutlets only need about 30 minutes. Boneless, skinless breast halves and thighs can marinate up to 6 hours. Enjoy! This is the third day in a row I’m having this salad for lunch. So, so tasty, Pamela. Thanks! I love hearing that, Janet! A big crowd pleaser, again! This has become my go-to salad! Nice to hear, Clare. Hope you had a great Cinco de Mayo! I put your salad on Pinterest and it has already been repinned several times. Your name and web site are at the top of the photo so maybe I’m spreading the word? Oh my. I’m going to go soak some pinto beans right now. This just sounds scrumptious! Thanks for the recipe.